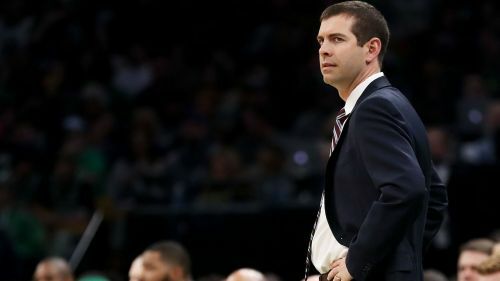 Brad Stevens plans to "look at everything" amid the Boston Celtics' form slump in the NBA. The Celtics suffered their fifth loss in their last six games with a 115-104 defeat to the Houston Rockets at TD Garden on Sunday. "Obviously, we'll look at everything," Stevens told reporters, via ESPN. "We've been looking at everything after every game. Every night when you go to bed, every minute when you wake up, you're always thinking about that. There's things that – that are helpful in that, and things that are not helpful. "And if it's the root of your issues, then I think a small tweak can help. I'm not sure that that's our root [problem] … When we have six or seven guys playing well, we're pretty good. We've just got to get back to that." Reserve forward Semi Ojeleye addressed the team and directed the Celtics to "wake the f*** up" during the third quarter of the loss to Houston. He told The Athletic he felt the outburst was necessary. "I don't normally do that, but I felt like we were kind of splitting apart," Ojeleye said. "And I think we have to try to change it. I mean, the season's wasting away. In the NBA teams are only together for so long. So, it's time to change it." "The reason you play basketball is to be a part of a group, a second family, a group of brothers," Ojeleye added. "I think right now we're struggling to find that in each other. And I think when we do – because we're definitely capable of it, we've shown it at times – I think everything will come together." The Celtics dropped to 38-26 and are in fifth place of the Eastern Conference standings. They will face the Golden State Warriors on Tuesday.